Kia ora. Here’s our summary of the webpages, blog and social media posts that were popular in December. Summertime Reading Club is in 19th spot, and the Christchurch Photo Hunt winners at 35th. Survivor winner Lisa Stanger’s 2014 blog post Christmas reading for kids came in at 4th place. There were 109,564 views in December on Flickr. It now has a total of 8,817,963 views. Follow us on Twitter. As at 8 January, we have 5028 followers. #ChristchurchAdventCalendar 24 Christmas images from the #DiscoveryWall. Sunday 9 Dec: @whatnownz Christmas, 24 December 1989. Simon Barnett, @MicheleACourt and Catherine McPherson. Christchurch Star archive. In copyright. CCL-StarP-01642A. Like us on Facebook. As at 8 January, we have 9027 likes. #ChristchurchAdventCalendar 24 Christmas images from the #DiscoveryWall. Tuesday 13 December: Mark Nicholl with Christmas tree, 13 December 1980. A child, Mark Nicholl, on his bicycle carrying a Christmas tree in Sydenham. 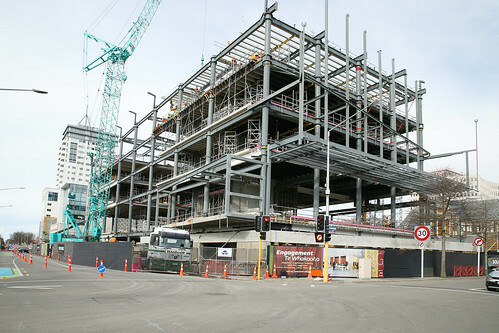 Christchurch Star Archive. In copyright. CCL-StarP-02309A. #ChristchurchAdventCalendar 24 Christmas images from the #DiscoveryWall. Sunday 9 December: What Now Christmas, 24 December 1989. The presenters of What Now, Simon Barnett, Michele A’Court and Catherine McPherson getting ready for Christmas morning show by decorating a Christmas tree. Christchurch Star archive. In copyright. CCL-StarP-01642A. “It is my first time to see Korean books in a library!” an elated Donggi Jun said when he saw shelves of books in his native Korean. Find out more about the World Languages Collection at Tūranga – it includes books & magazines in 13 languages. Kia ora. Here’s our summary of the webpages, blog and social media posts that were popular in November. Join the Library has become more popular in the last few months and more Tūranga pages are in the top 50 – meeting rooms and bookable spaces, café, transport, and floor by floor. There were 147,719 views in November on Flickr. It now has a total of 8,708,399 views. I’ve picked my fave New Zealand book covers of 2018. I've picked my fave New Zealand book covers of 2018. Kia ora. Here’s our summary of the webpages, blog and social media posts that were popular in October. Join the Library was in at number 12, and more of our Tūranga pages were in the top 50. Not published in October, but attracting views was The old homestead at Stonyhurst a Picturing Canterbury post by Simon (published March 2018). There were 267,397 page views in October on Flickr. It now has a total of 8,560,680 views. Follow us on Twitter. As at 5 November, we have 5017 followers. Thank you Christchurch people. Tūranga is for you. Like us on Facebook. As at 5 November, we have 8841 likes. Doors open to the public for tours at 1pm. Kia ora. Here’s our summary of the webpages, blog and social media posts that were popular in September. Other popular pages: Te Wiki o te Reo Māori and Tūranga information was popular this month. There were 140,750 page views in September on Flickr. It now has a total of 8,293,283 views. Follow us on Twitter. As at 31 September, we have 4963 followers. Not a glass ceiling, but "a thick layer of men". Like us on Facebook. As at 31 September, we have 8563 likes. Kia ora. Here’s our summary of the webpages, blog and social media posts that were popular in August. There were 199,746 page views in August on Flickr. It now has a total of 8,152,533 views.